Northrop Grumman's Proteus test aircraft approaches a NASA Global Hawk during a flight from NASA Dryden Flight Research Center on Jan. 21, 2011 to study the wake turbulence from the NASA Global Hawk. Aerial refueling could keep drones such as the NASA's Global Hawk airborne for up to a week. Now two drones have taken a record-setting step toward that future by flying as close as 40 feet apart during a test on Jan. 21. A Northrop Grumman Proteus test aircraft and a NASA Global Hawk engaged in their aerial courtship at a nose-bleeding altitude of 45,000 feet. That test helped human engineers better understand and reduce the risks leading up to the first autonomous aerial refueling of two Global Hawks in the spring of 2012. Photo taken of a NASA Global Hawk from Northrop Grumman's Proteus aircraft camera during aerial refueling test approaches. "When you add autonomous flight of both aircraft into the mix, as we will do later in the KQ-X program, you gain a capability that has mission applications far beyond just aerial refueling," said Geoffrey Sommer, KQ-X program manager at Northrop Grumman Aerospace Systems sector. A previous DARPA effort used an F-18 fighter jet as a stand-in for a drone during a test of autonomously refueling from a 707 tanker aircraft. The latest flight test with the actual drones checked out how well the unmanned aircraft flew with the wake turbulence. 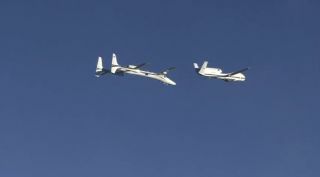 The drones also engaged in simulated breakaway maneuvers for when the refueling deed was done, so that they can get on with their stealthy surveillance activities. This story was provided by InnovationNewsDaily, a sister site of SPACE.com.